Live From The Wang: What Is My Reaction, What Should It Be ? So after spending about an hour at the eye doctor and trying out several different versions of monovision prescriptions, I eventually convinced the doctor that I REALLY WANTED TO TRY MULTIFOCAL LENSES. My NEAR vision isn't great, but my midrange (PC) and distance are flawless so...I think this is IT for me perhaps. Perhaps. I came home and my daughter brought me her little Nintendo thing she plays games on, and asks me what the words are. I read "Help me find my pet!" and "Oh thank you for helping me find my pet, Sparkle Pillow Pants!" Ok it wasn't Pillow Pants - but if you get the reference you earn 25 cool points. But then, after she completes another little silly goal it comes up with this, that she asks me to read. I sat there for a moment, considering these words. The sun doesn't rise and set on the insipid stupidity found within a video game, yet I have to admit - I lied to her. I said "It says thank you so much for the great gift!" 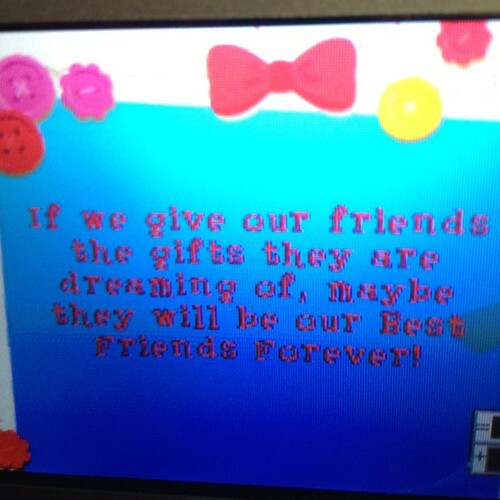 I don't think that my daughter is going to spend the next 80 years of her life believing that friends can only be bought because of a video game. But I do think that small things add up into big things. How many small, incidental messages about how I look did I receive over the years that led me to the place I am now, pretty deep in bad body image land? 100? 200? 20000? What a sick message to blast at small children.Is it lost in translation? I don't know where La La Loopsie comes from, but I would really like this to be a bad translation yet I fear it's not. Rather I think it's just something meaningless someone stuck in a game without a thought. I don't think that everything needs to be a teachable moment. Hell, I don't even think that everything needs to be CORRECT all the time. But I just feel like some measure of appropriateness should be observed. We shouldn't tell ANYONE that the right gift will make someone your friend for life, much less a small child. She can still play the stupid game, I'm not THAT tyrant. But still, it irks me. I'm kind of glad she can't read well yet.